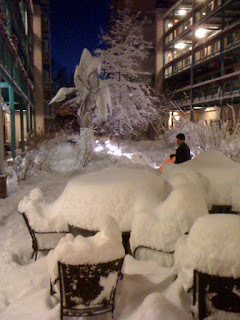 I enjoyed the biggest snow storm in D.C. since moving here in 1999. The craziness began when I ventured out at 8 p.m. Friday to help DJ my friend Jason's birthday party at Yanni's Greek Taverna in Cleveland Park. It was already blizzard-like on my walk to the metro. By the time I arrived at the party, I had heard it reported that there were hurricane-like winds (which we could see out the front window of the bar along Connecticut Avenue) and "snow thunder!" We had a great time celebrating with Jason and the turn-out was impressive (everyone loves Mr. Gallo). Several of us waited as long as possible to get to the metro. We caught the last train around 3:30 a.m. I spent the night at Dan's house since I needed to get to the Georgetown hoops game on Saturday at noon against #2 Villanova. 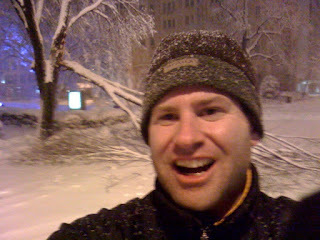 The walk from Farragut North to Dan's apartment in Thomas Circle was intense, with bitter winds blowing in our faces and a fallen tree slicing a snow-drifted L Street in half. Peter and I walked to the Hoyas game which, although I was beyond exhausted from the night before, was one of the season's best (and that's saying a lot because it's been a great season). 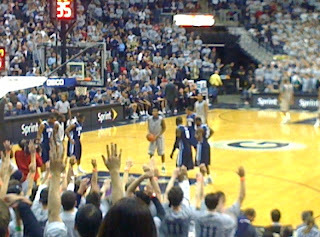 Georgetown won 103-90, although it wasn't necessarily that close, in front of a surprisingly near-full arena. Looks like we'll end up with somewhere around 18 to 20 inches over the past 36 hours or so. In places, it seems we may have actually gotten quite a bit more. Fun stuff. There hasn't been nearly enough snow over the years in D.C.